God and christians can have a hit presence on tv. The hit TLC reality show, “Rattled,” introduced viewers to Christian couple Julia and Ryan Sadler. The Sadlers work together ministering to youth at First Baptist Church of Dallas where Julia’s father, Dr. Robert Jeffress is the senior pastor. The Sadlers, sweethearts since middle school who today have offices literally next to each other, were married for seven years before becoming pregnant. The joy of pregnancy was replaced by the searing pain of miscarriage—not once but three times in just one year. The pain and stress that even one miscarriage puts on a couple is profound. Research reveals that couples who have a miscarriage are 22 percent more likely to break up. In that dark time, the Sadlers refused to give in to discouragement and found solace in their strong faith, holding tight to Ephesians 3:20: “Now to him who is able to do immeasurably more than all we ask or imagine, according to his power that is at work within us.” Armed with the promise of Scripture, they had the boldness to ask God for what seemed impossible: three biological children. And God answered their prayers — dramatically and all at once, as the couple, who had sought treatment at a fertility clinic — became pregnant with triplets. 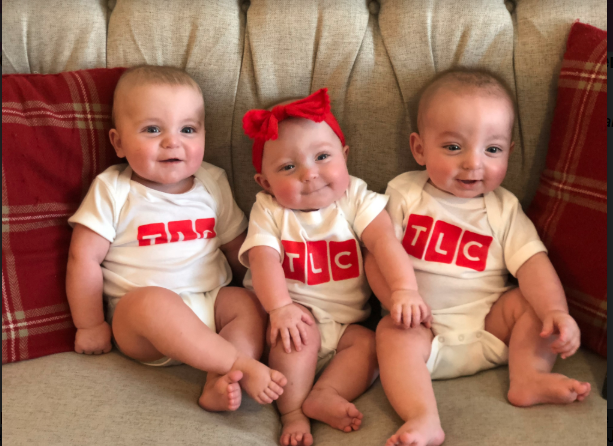 Any triplet pregnancy is by definition high risk, and as the episode ends, we learn that the Sadlers have a difficult and dangerous road ahead. Meet the family that is taking tv by storm.